Like your pani puri a little wacky or don't mind experimenting with something new? The PaniPuri Shop in Madhapur is where you can get a taste of far out. We all love hygienic and well-decked food stalls, and The PaniPuri Shop certainly makes the cut. Serving you seven types of pani puri, this kiosk is a major hit in its vicinity. What this means is that it has seven types of juices — ginger, garlic, hing, lemon, jeera, pudina, and of course, regular. We were handed our bowls and we started digging in right away. The garlic and pudina juices are our favourite; we recommend skipping the lemon one as it just doesn't go well with the puri. Each plate is priced at INR 30 and comes with nine pieces (Two masala puri), and we found it a little overpriced. 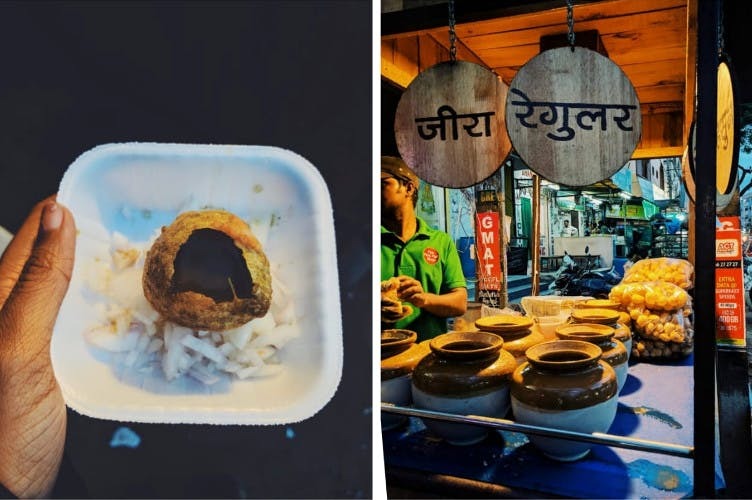 We wanted to try out the other dishes like dahi bhalla, dahi puri, chaat, but the stall wasn't properly managed to serve any dish other than pani puri. So, well, if you're looking for something different once-in-a-while, this might serve the deed. But otherwise, we love our local pani puri bhayya a little more. Oops! Plus, the service is slow and poor.